There is an LED sign at a Chase Bank in downtown Midland, Texas, the heart of the Permian Basin, which quantifies the current oil boom. It alternates between current rig count, the price of oil, and the price of gasoline. On October 30, the day I arrived, the sign informed me there were 1,068 drilling rigs across the United States, of which 489 — nearly half — are in the Permian Basin. Though the flashing sign is meant to celebrate the fracking boom, Sharon Wilson, Texas coordinator of Earthworks, sees it as a warning sign of the urgent need to cut greenhouse gas emissions to avoid catastrophic climate change. 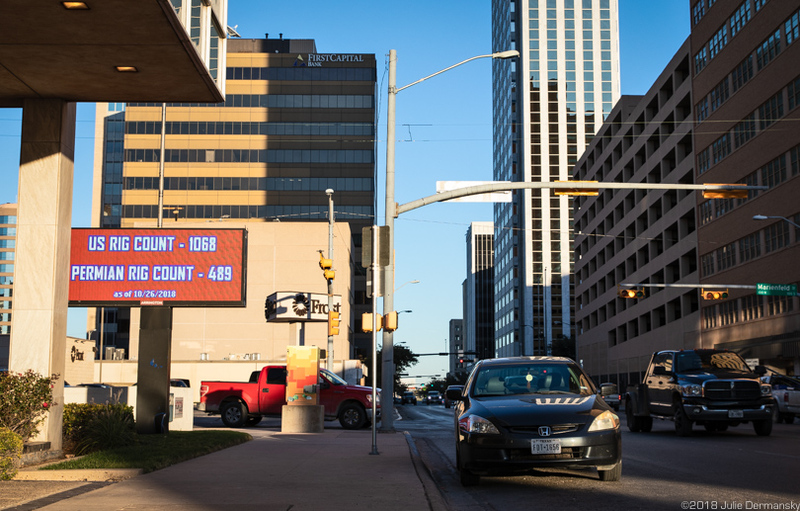 LED sign counting rigs in the U.S. and Permian Basin in downtown Midland, Texas. The Permian Basin is one of the most prolific oil and natural gas basins in the U.S. Roughly 250 miles wide and 300 miles long, it spans West Texas and southeastern New Mexico. The approximately 86,000-square-mile area encompasses several sub-basins, including the Delaware Basin, Central Basin, and the Midland Basin, all of which are in the midst of the latest oil boom. Wilson, an outspoken anti-fracking activist, has advocated for better regulations to rein in the fracking industry, which utilizes horizontal drilling and fluid injections to crack open shale to release oil and gas trapped inside. But she no longer believes regulations are the answer because state and federal governments aren’t prepared to enforce them. “The only way to save the planet from climate change is to stop fracking now,” she told me. The frenzied expansion of the oil and gas industry in the Permian Basin over the last two years is like nothing Wilson has ever seen. Infrastructure tied to the fracking industry — from well pads and waste disposal plants to pipelines and energy transfer sites — is being built faster than ever. Wilson has found some sites operating before posting signs identifying who owns and operates them, which is illegal and makes filing potential air pollution complaints difficult. 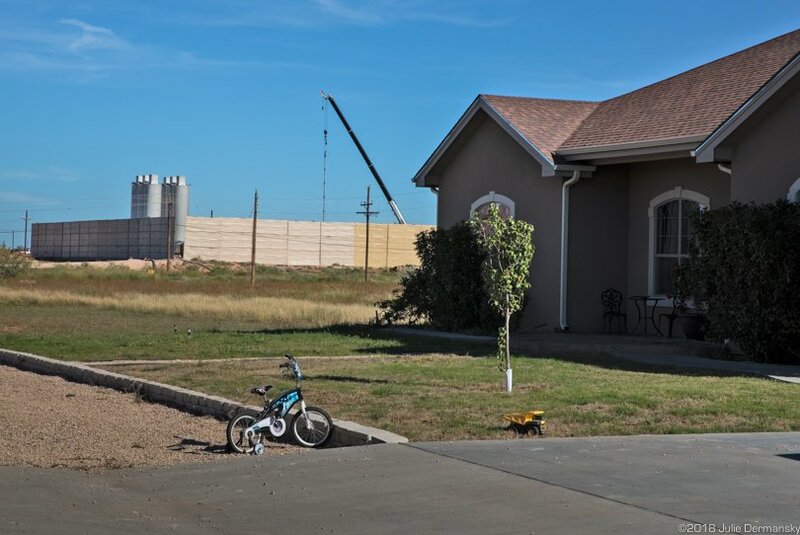 Frack site near homes in Midland, Texas. 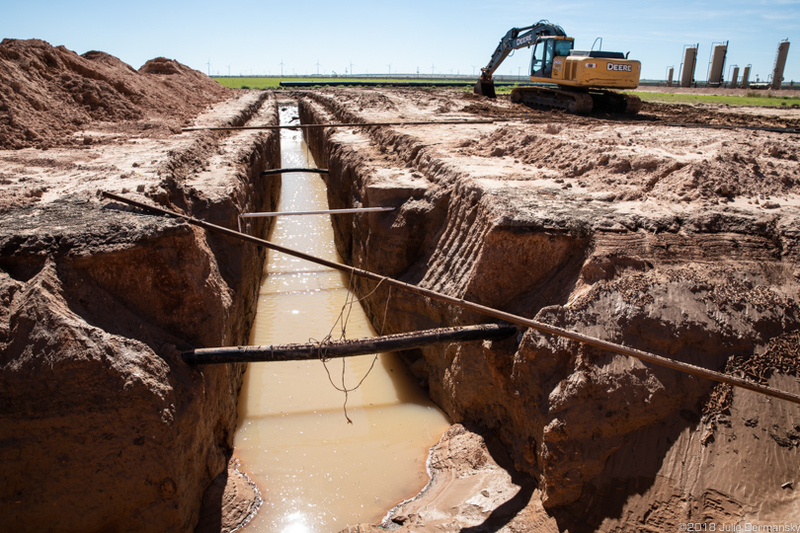 Pipeline construction site in the Permian Basin. “Stopping climate change is the most important issue of our time,” Wilson said, “but not enough people get methane’s role. We are on a path to planetary suicide, and what is going on in the Permian Basin proves that.” Driven by this belief, Earthworks has been spending time and resources trying to bring light to the region’s methane problem. “If we stop methane emissions, the planet will have an immediate response,” she points out. To do that, Earthworks says fracking, which has helped unleash a glut of natural gas and oil drilling in the U.S., must stop right away. Methane, the main component in natural gas, is a greenhouse gas that is up to 86 times more potent than carbon dioxide in the first 20 years after entering the atmosphere. A study organized by the Environmental Defense Fund (EDF) and published in June this year reports that the U.S. oil and gas supply chain is leaking roughly 60 percent more methane than previous Environmental Protection Agency (EPA) estimates, which largely relied on industry self-reports. Four drilling rigs off Interstate 20, West of Midland, Texas, in the Permian Basin. 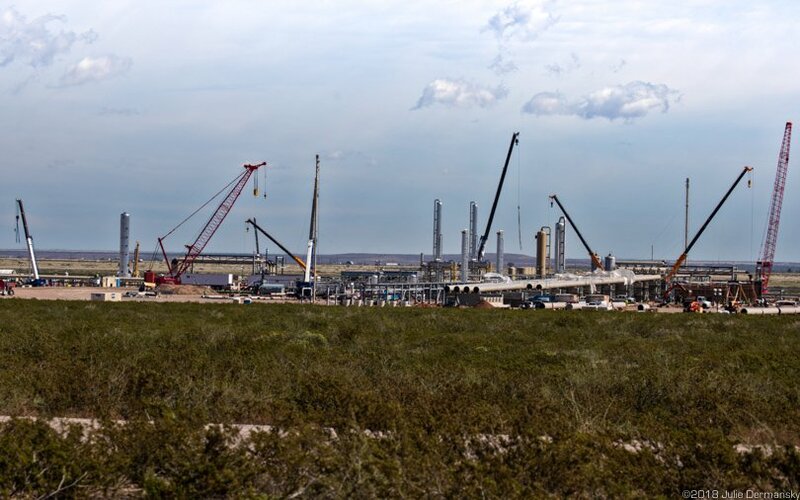 A cryogenic air separation plant, which can be used to process raw natural gas and in oil and gas recovery, under construction in the Permian Basin. The UN’s Intergovernmental Panel on Climate Change (IPCC) released a report in October stressing the urgency of lowering globe-warming emissions. Known as the 1.5°C report, the IPCC’s projections give humankind 12 years to reduce emissions enough to limit climate change catastrophe. It concludes that human-caused greenhouse gas emissions have already pushed average global temperatures up by 1°C (1.8°F) since the second half of the 19th century, and that urgent changes are needed to keep warming limited to 1.5°C total in order to reduce the risk of extreme heat, drought, floods, and poverty. The IPCC’s predictions show that even if the Paris Agreement’s current pledges are met, emissions are not being cut fast enough to keep global temperatures from rising another half degree Celsius by 2100, according to the group Climate Analytics. The EPA’s latest annual Greenhouse Gas Reporting Program, also released in October, confirms that methane emissions are not going down quickly enough. The report provides a snapshot of large emitters, indicates 2017 oil and gas methane emissions, and shows emission trajectories across the country that are on the rise. 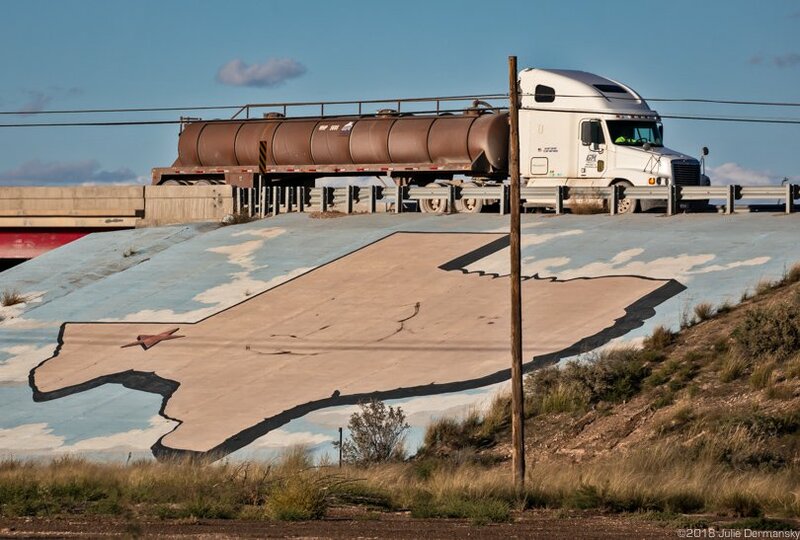 Mural of Texas with truck used by fracking industry in Pecos, Texas. The EDF’s own study on methane emissions released earlier this year gives a more comprehensive account of methane releases than the EPA’s report. Though both call for further cuts to methane emissions, the Trump administration is moving in the opposite direction, first, by announcing the U.S. would pull out of the Paris Agreement, and then rolling back the EPA’s first-ever national rule, enacted in 2016, to directly limit methane emissions from oil and gas operations. 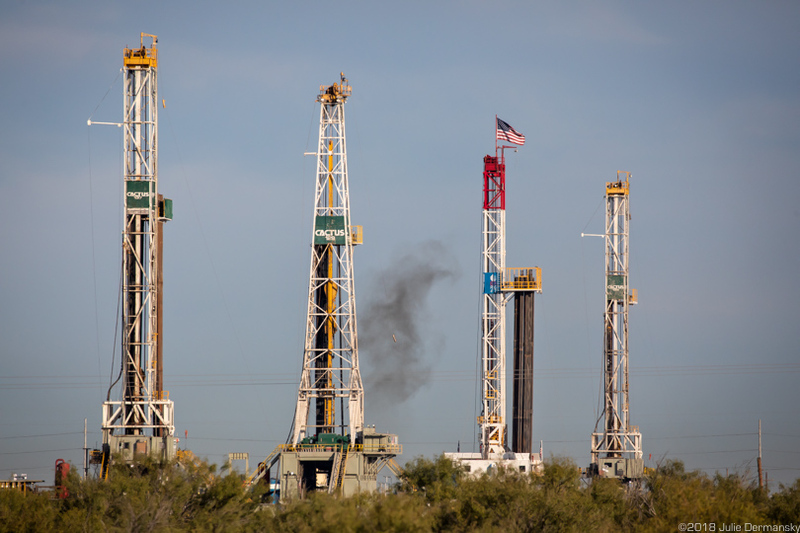 Wilson is encouraging journalists to come see how widespread emissions of methane and other volatile organic compounds (VOCs) are at oil and gas sites in the Permian Basin. On October 31, I met up with her and Alan Septoff, Earthworks’ strategic communications director, during one of their air monitoring trips in Pecos, Texas, a city in the southwest region of the Permian Basin. “There are hitchhiker gases or VOCs that come with the methane too,” she added, explaining that identifying which compounds are present would require more precise air monitoring. And while each fracking industry site is permitted to emit certain amounts of gases at various stages of production, Wilson can often identify clear violations, and when she does, she submits a complaint to the state. We also stopped at other sites where the smell of rotting eggs, a sign of the hazardous gas hydrogen sulfide, suggested more leaks were likely to be found. The optical gas imaging camera made it easy to see dense plumes of emissions coming out of tanks and hatches that, Wilson explained, often could be contained if industry used available methane emissions control technology. But such devices are not required and are hardly the norm. We drove for miles with the smell of rotten eggs permeating the car. At some of the sites, the smell was so strong I became queasy. Methane is colorless and odorless, but if powerful-smelling hydrogen sulfide is leaking from drilling sites, methane likely is as well. Andrea Morrow, TCEQ’s media relations manager, begs to differ. She told me during a call that the agency monitors emissions in numerous ways: “If we see something that is amiss on a fixed monitor, we check it out.” However, the agency has only four air monitors in the producing areas of the Texas Permian, despite the vast area, leaving some oil and gas sites well over 100 miles away from the nearest monitor. She added: “If we get complaints, that would be another driver,” and noted that the agency performs both regular and unannounced inspections at oil and gas sites. Morrow couldn’t quantify how many unannounced inspections were done in the Permian Basin this year. The way the agency keeps records doesn’t work like that, she explained, but offered me a link to TCEQ’s Annual Enforcement Reports and the agency’s Air Monitoring Data page. Wilson acknowledges that TCEQ follows up on some of the complaints Earthworks files. “Some of the complaints have led to sites being shut down temporarily until a problem is fixed. Though in most instances after one part is fixed, another will fail and the leaks are endless,” she said. 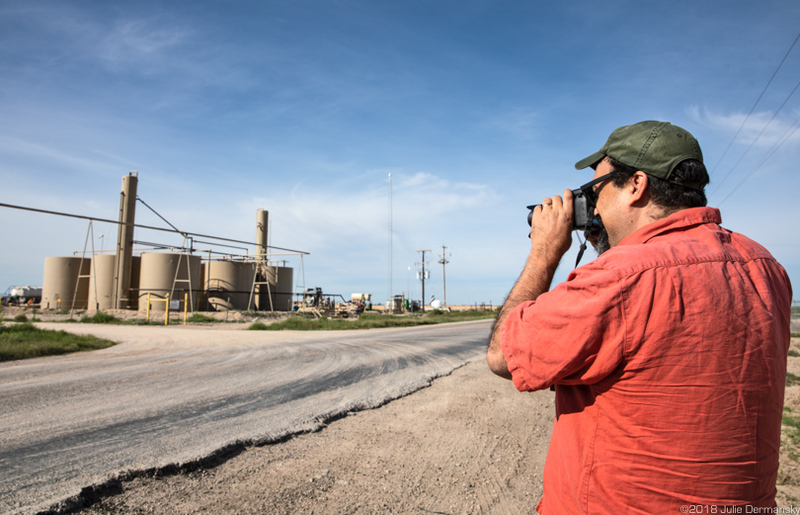 Alan Septoff photographing a fracking industry site in the Permian Basin. 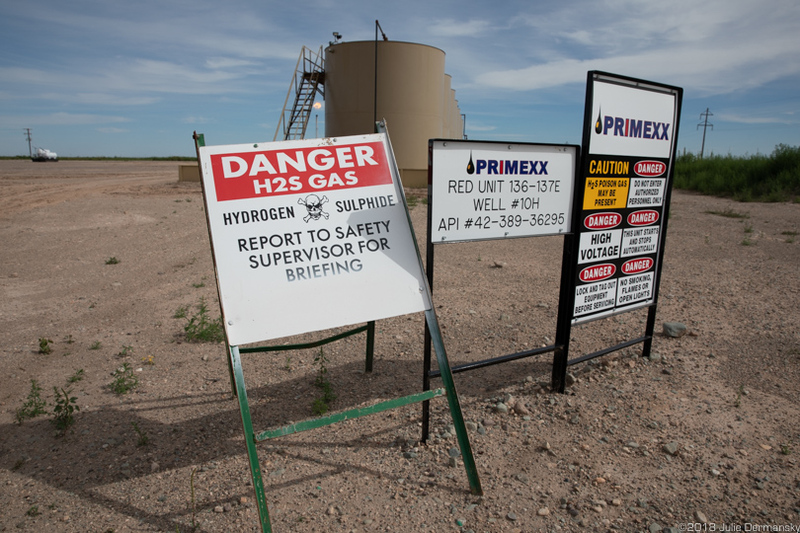 Signs warning of various hazards, including hydrogen sulfide gas, at a fracking site in the Permian Basin. “One way not to quantify a problem is not to monitor it,” Septoff said. He thinks the lack of urgency toward reducing methane emissions is due, in part, to so few people understanding how much methane the fracking industry releases and its contribution to climate change. “President Obama did a disservice by selling the notion that natural gas is a bridge fuel,” Septoff pointed out. The same misguided idea was embraced by Carl Pope, the former executive director of the Sierra Club. Although the Sierra Club no longer touts natural gas as a form of “clean energy,” the misleading narrative is still touted by industry representatives and politicians on both sides of the aisle in states where the fracking industry operates. Cornell University Professor Emeritus Dr. Anthony Ingraffea and his colleagues have published studies showing that because so much methane is released as natural gas is drilled and delivered to market, the fossil fuel billed as a “bridge fuel” may be as harmful to the climate, if not more so, than coal. Ingraffea’s work also has outlined the role U.S. fracking plays in changing the world’s climate. In a lecture entitled “Shale Gas: The Technological Gamble That Should Not Have Been Taken,” Ingraffea explains that initial studies about climate change didn’t factor in the strong warming power of methane emissions. “The most recent climate data suggests that the world is on track to cross the two degrees of warming threshold set in the Paris Accord in just 10 to 15 years,” he said in his lecture, released April 4. 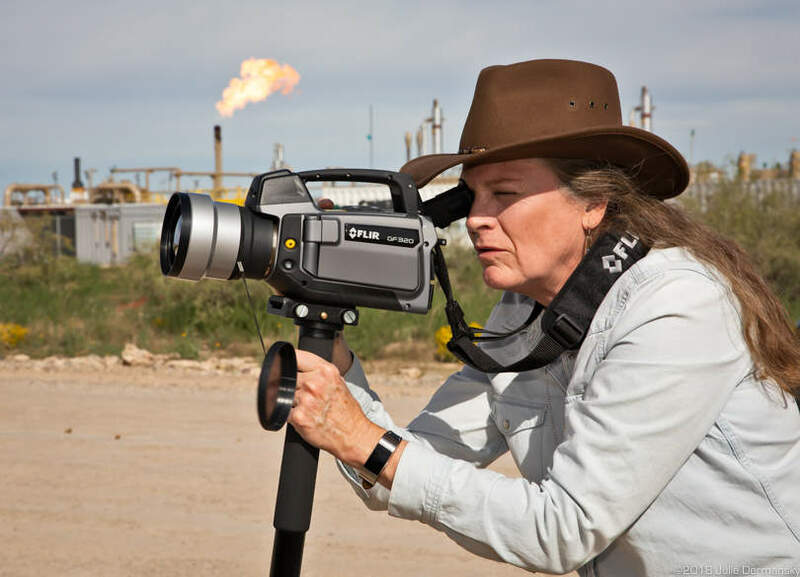 Sharon Wilson in the Permian Basin documenting emissions at oil and gas industry sites. Wilson and Septoff believe the fastest, most dramatic way to slow the warming of the planet is to stop all fracking now. The Permian’s fracking boom, combined with the 2015 lifting of the crude oil export ban, is driving record-breaking exports of oil from the U.S.